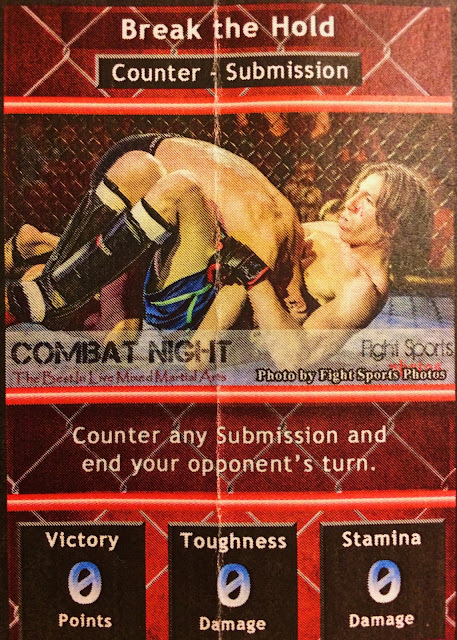 WARNING: This is a preview of the MMA Combat Card Game. All components and rules are prototype and subject to change. 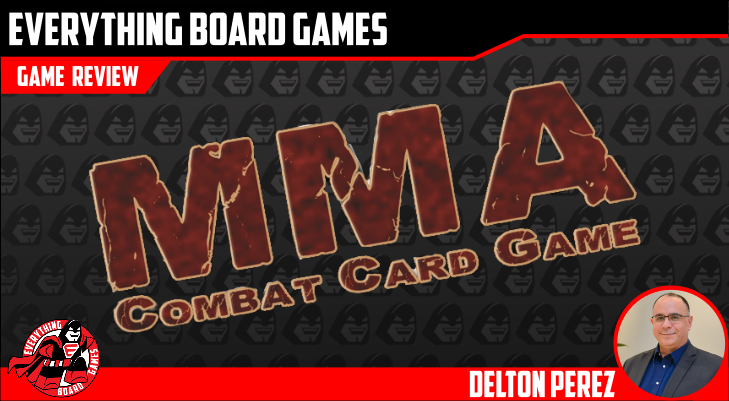 MMA Combat Card Game is a 2-player card game where each player has their own deck of 50 cards and is working towards lowering their opponent's life count from 30 down to 0 in three rounds of game play. 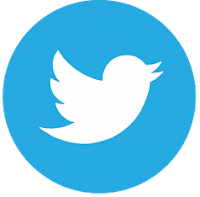 MMACCG is a deck builder, meaning you are able to customize your decks using cards that come with the game. There are some limitations set to the decks (50 cards maximum in your Stamina deck, five cards in your Routines deck, no more than three copies of any non-unique card, and only one copy of any unique card in the deck). Outside of these rules, you can completely change your deck to match your style of play. 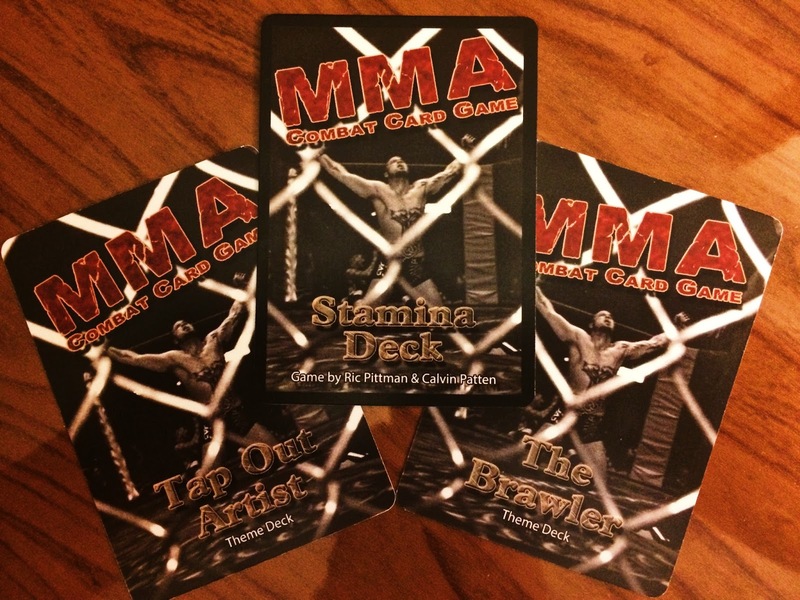 Speaking of decks, the game has four pre-made decks available, each customized to work with the individual styles: the Brawler (keep the opponent standing and lay massive damage to them), the Tap-Out Artist (submissions expert, laying holds once you are grounded), the Muay Thai Specialist (focused on clinching and laying massive beats on the opponent), and the Ground and Pound Artist (solid all-purpose deck, able to do damage either standing or to a grounded opponent). Each player will then take their deck of 50 cards, shuffle them, allow their opponent to cut the deck, then draw their starting hand of six cards. You may, if you choose, select three cards, place them aside, draw three replacements, then shuffle them into the deck. 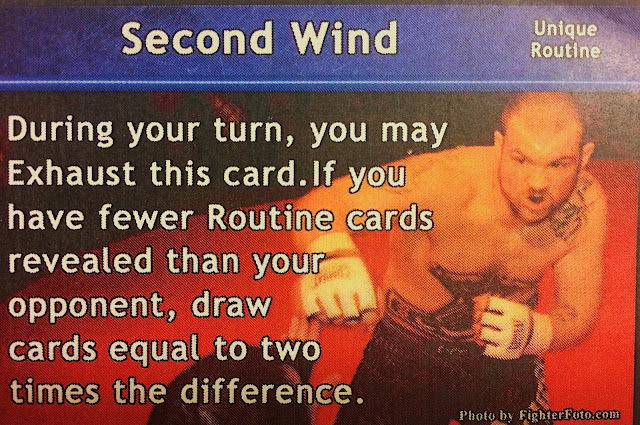 The game also allows for an advanced mode using cards called Routine cards. If you are playing with these cards, you will have a separate pile of cards for them, from which you will draw three cards, placing them face up in front of you. Game play continues up to three rounds. Each round consists of a player playing up to five of their cards and each player taking a turn. After three rounds, a winner is determined. 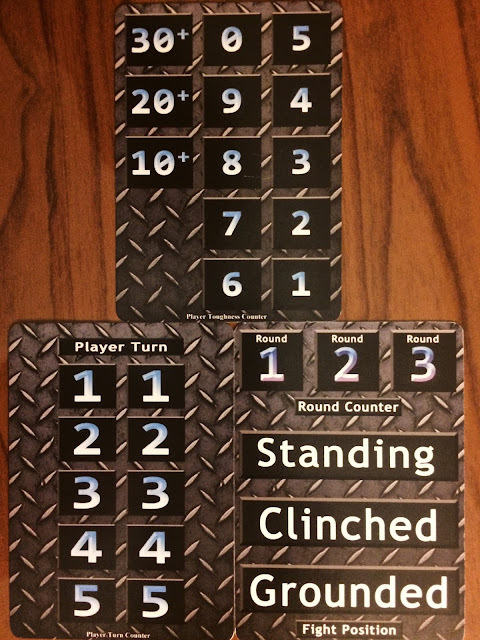 There are three conditions that lead to a victory: knock out your opponent (lower their life total to 0); successfully play a card that states that you win the game; or, if no player has met the first two conditions, count the victory points of cards played successfully, and the player with the highest count wins. The cards are meant to work in three different stances, similar to a MMA match. 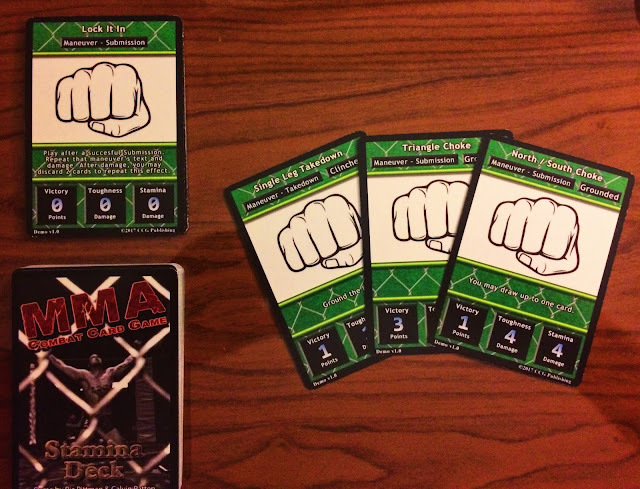 Each card will work both with and against your opponent, who will be either Standing, Clinched, or Grounded. 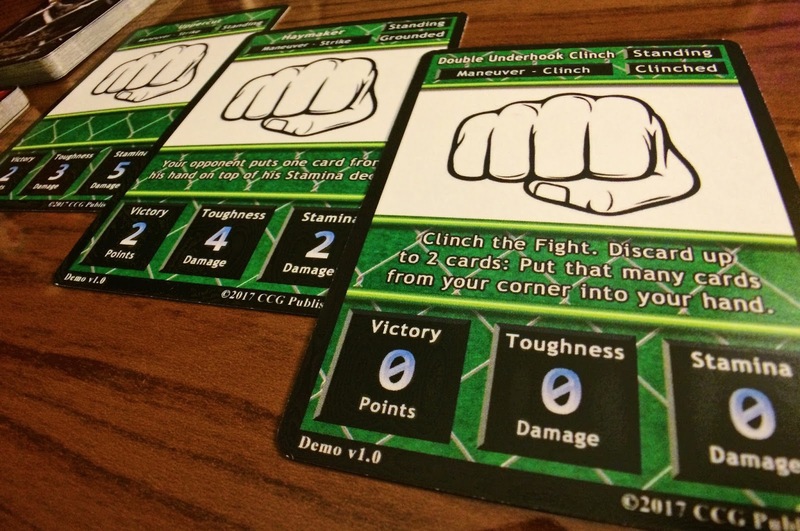 The text on the cards will show what stance the opponent needs to be in for it to work. That is, if your opponent is standing, you cannot use a move that requires them to be grounded. You will play cards into two different areas of the area in front of you. Cards discarded (or removed from your deck) will go into a pile called the "Corner Area," while cards that you successfully played go into a pile called the "Cage Area," which are used in case of a tie at the end of the game. Mechanically, MMACCG is very straightforward. On your turn, you will be playing a number of cards to do damage to your opponent. There are cards that have the keyword "Counter" on them which allow you to counter a move that an opponent is using on you. If a counter is played, the turn for that player is over and the next player will take their turn. Gameplay for MMACCG is very straightforward. On your turn, you will draw a card, then play up to five cards until either you have played what you want or your opponent plays a counter to your move. At the start of the game, you will be drawing cards from your deck (called the Stamina deck), playing them on your turn, and resolving the damage that is done to your opponent. If damage is done to the opponent successfully, you lower their life total, then look at the card you played to see what the stamina value is. If there is a number in that box, your opponent will take that number of cards off of their stamina deck and place them in the discard pile. When you are taking damage and removing cards from the stamina deck, you will be turning these over one at a time. The reason for that is that if you turn a "Counter" card over, you can immediately play it and stop milling your cards. That’s right, you can interrupt the opponent who thinks they’re making you lose the good cards in your deck, and end their turn immediately. There are also "Referee" cards, which need special conditions to occur for them to be played. For example, one of them can only be played after a submission has been played, and if the opponent has taken at least 15 points of damage in a turn. The reward for playing it? Instant win! Another one lets your referee put everyone in the Standing position, and everyone draws three cards. As mentioned above, a prototype was provided for this review. 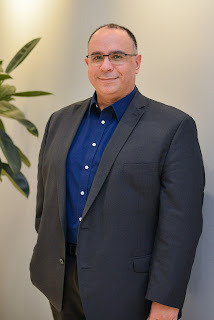 A sample of the card artwork was provided and can be seen below. Looking at the placement of the cards received, and the images provided in the sample art, you can see that the artwork shows images you would expect to see in a MMA match, with multiple fighters and holds being used. The images appear to be actual photos from matches, adding additional realism to the game. The cards size provided were standard size, and the text was easily readable against the dark background. As the game runs fast, you'll probably want to sleeve the cards, as you'll be shuffling them after each game. MMACCG has some great things going for it. While the game says it needs 10-15 minutes, it’s really close to that 10-minute limit. This is fast!! You can do an entire game between rounds of another game or while waiting for your turn to play in a long board game. Also, you only need two people to play this game. 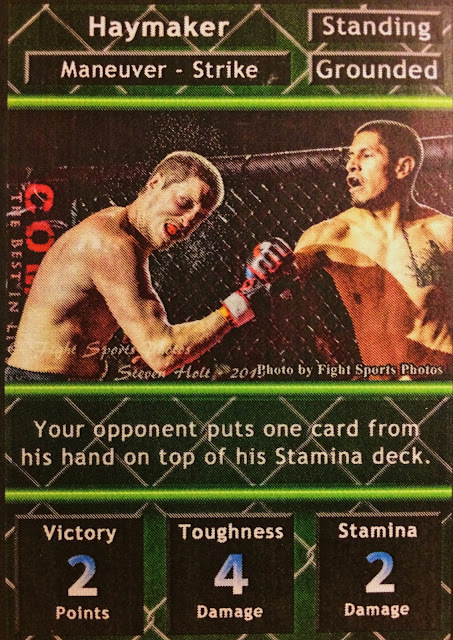 The card artwork adds to the realism of the game, as you can see actual images of the moves and counters. The four different styles of play are also awesome. Want to play as a brawler? No problem. More into submissions? Let the Tap-Out Artist show you how flexible you're not. Ground and Pound? Been there, done that. Muay Thai? Oh, heck yeah! You know, rules are always the hardest thing to put together. While this is a prototype and not the final version, the rules are a bit hard to follow and understand. That being said, after playing one turn, you know everything you need to know, and will only use the rulebook to remember how to score if there’s a tie at the end. Additionally, there is no indicator on the cards to show which base deck it would go with. So if you’re looking to reset the game to its base set, there doesn’t appear to be a way to keep track of which card goes to which deck. Something like a number at the bottom of the card (i.e. Card 23/125) would suffice. Ten minutes! Seriously, that's all it takes to play a full game. 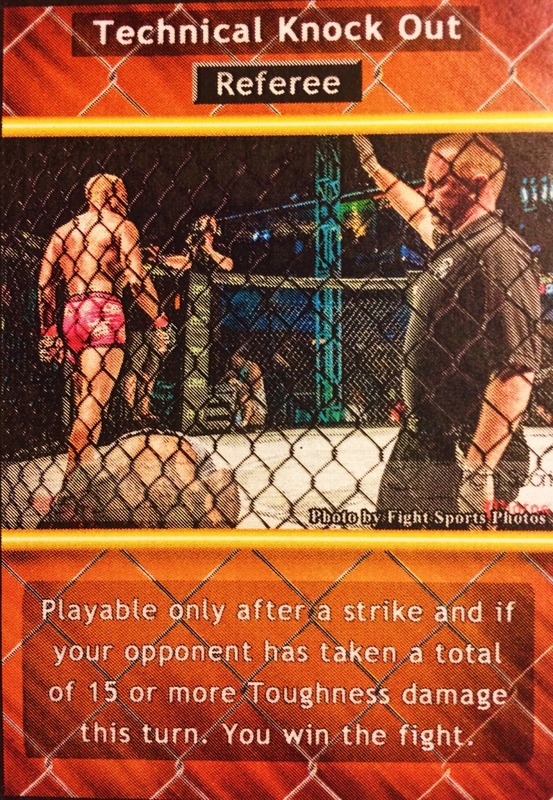 Gameplay isn't difficult, and if you've ever seen an MMA match, you already know most of how the game would play. Remember the game where you were looking to take someones money during lunch, but had to always look a rules to see if you can land a roundhouse or if you needed to grab someone first? Yeah, completely eliminated looking that up. Everything is right on the cards that you need. Get this. You will enjoy it! That being said, if you're looking for a big deck builder, this isn't for you. Yes, you can customize your deck, but at this time, the cards included in this set is all there is. CCG does not stand for Collectible Card Game in this instance. 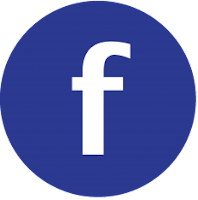 Card based combat games, two-player games, fast gameplay.